Visiting the refugee camps in and around Kutupalong, south of Cox’s Bazar in Bangladesh, was the principal reason for my recent visit to the country. Planet Wheeler, my foundation, works with COTE (Children on the Edge) to provide education to some of the children amongst the half a million Rohingya refugees pushed out of neighbouring Myanmar by that country’s government. I took the opportunity to visit a site which has fascinated me for years, the shipbreaking beach which stretches for about 15km through the Sitakunda district (or Sitakunda Upazila) north of Chittagong, the biggest city in Bangladesh after the capital Dhaka. 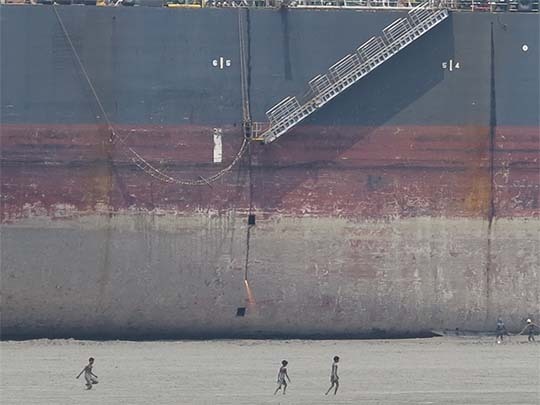 There are plenty of stories online about Bangladesh shipbreaking and on Google Earth it’s easy to spot the gigantic ships littering the Sitakunda beach. 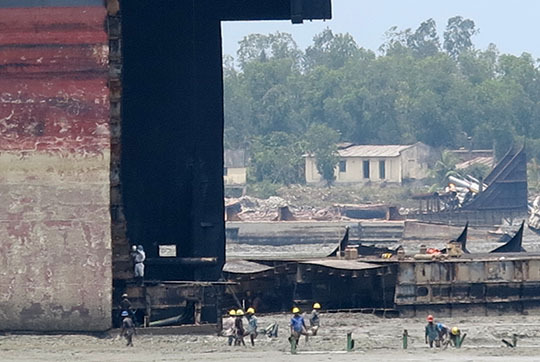 Click here for the International Federation for Human Rights report on Bangladesh shipbreaking. ▲ I wanted a photo contrasting the children on the beach to the gigantic ship, it was only when I looked closely at the photo that I saw that somebody was inside the hull using a blowtorch to slice right through the hull to break it up. Shipbreaking really started here in the 1970s and for a spell in the 1990s this was the biggest shipbreaking centre in the world, 50% of all the world’s shipbreaking took place here. There are often as many as 50 ships on the beach here being torn apart. You take your past-its-use-by-date tanker, container ship, bulk carrier or whatever offshore at high tide, aim for the beach, ‘all engines full speed ahead’ and push it up on the sand. Then teams of men (and children at one time) descend on it and tear it completely apart, pretty much by hand. Of course it’s terribly hard work and extraordinarily dangerous. There are frequent deaths and regular accidents from falling metalwork, toxic fumes, explosions, asbestos removal and of course safety equipment is minimal. The shipbreaking beach became a major tourist attraction, not that there are many tourists in Bangladesh, until the industry’s shocking reputation led the government to ban foreigners, tourists and photographers. Nobody stopped me when I approached the beach at the Sandwip ferry jetty which stretches out into the sea at Bhatiari. 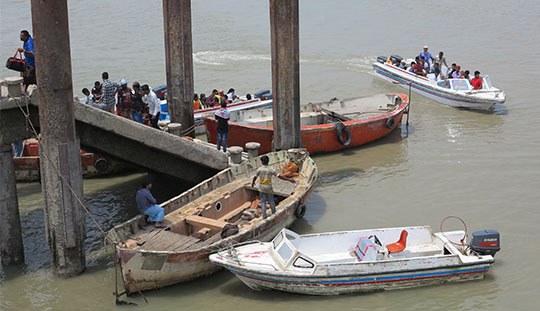 ▲ From here regular ferries shuttle out to Sandwip Island from where intrepid travellers can continue to Dhaka. ▲ One of the ships I could see was the Ohamana, a Korean sister ferry to the Sewol which capsized and sank in April 2014, killing 304 crew and passengers (many of them students) in an accident which caused huge outrage in South Korea. Operated by Chonghaejin Marine both ferries sailed between Incheon and Jeju. 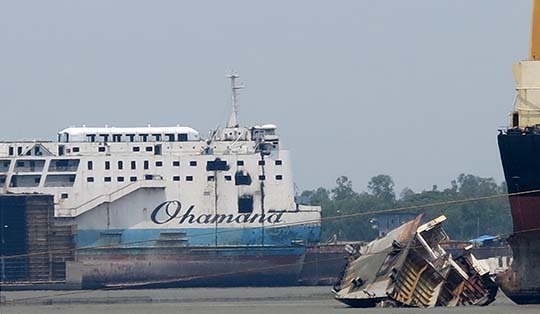 The Ohamana made its last voyage, on to the Sitakunda beach, in November 2017.